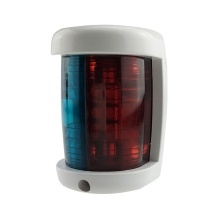 Two color light, red and green, super bright LED light, provides a simple and effective boat safety lighting. IP67 waterproof, no need to worry about the marine working. Made of premium quality material, stable and long lasting life. Easy to install and use, energy saving and low power consumption. Wide application, great boat accessories, ideal for most pontoon, yacht, boat, etc.